Goodreads says, "While most seventeen-year-old American girls would refuse to let their parents marry them off to a stranger, Robyn Mason dreams of the mysterious McKale in Ireland, wondering how he’ll look and imagining his cute Irish accent. Prearranged bindings are common for magical families like her own, however when she travels to the whimsical Emerald Isle she discovers there’s more to her betrothal and McKale’s clan than she was led to believe. What starts as an obligatory pairing between Robyn and McKale morphs over time into something they both need. But one giant obstacle stands in the way of their budding romance: a seductive and deadly Fae princess accustomed to getting what she wants—and what she wants is McKale as her plaything. Love, desire, and jealousies collide as Robyn’s family and McKale’s clan must work together to outsmart the powerful Faeries and preserve the only hope left for their people." Robyn Mason seems like a normal American girl except for the fact that she has magical blood. Her parents have reluctantly agreed many years ago to marry her off to a young boy from Ireland who also has magical blood. Robyn knowns after her high school graduation, she will have to go over there to meet McKale, her betrothed, and his clan. But things aren't exactly how she thought they would be and Robyn's family finds themselves in danger more often than not. 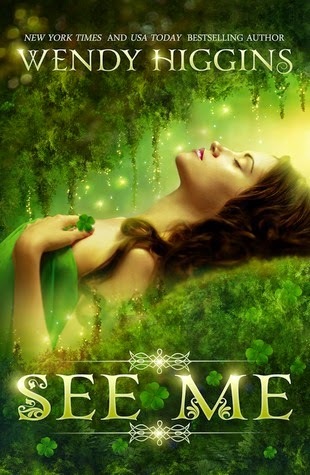 See Me by Wendy Higgins is a fun romp through the Emerald Isle and a perfect read for St. Patrick's Day. At first it was tough for me to relate to Robyn in See Me. She lacks confidence, has never really dated a boy before (so she's kind of clueless), and is one of those girls that thinks she isn't cute when actually she seems like a 5'11 supermodel. So, once she got her act together, I felt much better about her. Robyn has a sister, Cassidy, whom I really enjoyed. She's the opposite of Robyn. She's outgoing, says what is on her mind and is a bit reckless. I found myself laughing at her one-liners and enjoying her personality a bit more. When Robyn meets McKale things are complicated in See Me. I don't want to give too much away about McKale's clan, but it's complicated. For starters, McKale is sort of annoying in that he is like Robyn. He lacks also lacks confidence and is quiet from time to time. During the beginning of their courtship, all I heard was crickets. Awkward. Also, there's a fae princess/mean girl thrown into the mix that stirs up drama between Robyn and McKale. Higgins incorporates a lot of Celtic folklore in See Me. There's leprechauns, fae, and pixies. Plus, Higgins includes the concept of "normal people" that have magical blood and capabilities. Some parts of the story were a little silly, but I am really into Celtic folklore, so this was right up my alley. I have enjoyed Higgins' novels in the past, but I felt like her writing wasn't up to par in See Me. Higgins self-published this book so that may explain it, so I definitely think it could use some fine tuning. I've read other YA books involving the Fae like The Iron King series, Maggie Stiefvater's Ballad and Lament, and Marissa Marr's books but they aren't my favorite creatures to read about so I'd probably skip this one. The idea and setting sound interesting though. For readers looking for other Celtic inspired fantasy, there are Stiefvater's books and Tyger Tyger by Kersten Hamilton as well as Carrie Jones's Need series featuring pixies. Yes! I loved the first book in The Iron King series and I have read Ballad by Stiefvater --enjoyed that one too! I definitely enjoy Celtic inspired fantasy...what makes this one a bit different is the focus on leprechauns. I have never read a book with them as a focus before. I will have to check out Tyger Tyger, I heard great things. Thanks for the recommendations, Christina, and thanks for stopping by! It really is cute, especially if you like Celtic folklore --- perfect time of the year! Thanks for stopping by, Tara! You definitely should. Maggie Stiefvater has some good ones as well. Thanks for visiting, Jen!